These reductions would be hugely beneficial to public health budgets. In the United Kingdom, air pollution from coal power plants is responsible for an estimated £3.1 billion per year in added health costs through conditions like lung cancer and chronic bronchitis. The associated burden of air pollution from the country’s power sector is responsible for approximately 3,800 premature deaths each year due to respiratory disease alone. An additional 7,500 premature deaths occur each year nationwide due to air pollution from the UK’s transportation sector. 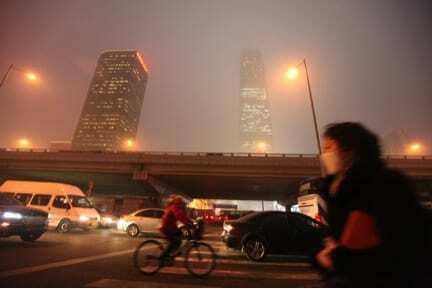 In China, air pollution led to 1.2 million premature deaths and 25 million healthy years of life lost in 2010, corresponding to economic loses of up to USD 1.4 trillion. Fine particulate matter (PM2.5) air pollution in China is believed to reduce average life expectancy in the country by approximately 40 months. All told, China already spends an estimated 0.37% of its GDP on cleaning the nation’s air. According to studies highlighted in the Lancet report, decarbonisation strategies could also be strongly cost-effective. For example, a combination of more fuel efficient vehicles and “active travel” (i.e. walking and cycling) in urban areas could lead to a net savings to the United Kingdom’s National Healthcare System (NHS) and social security costs in excess of £15 billion by 2030. These savings would be achieved through expected reductions in road traffic accidents and lower rates of obesity, diabetes, coronary heart disease, and stroke. Switching to electric and hydrogen cars would cut air pollution and increase the health benefits still further. Beyond transportation, improving the energy efficiency in homes could reduce winter mortality and improve respiratory health. More energy efficient housing could save the UK NHS around £600 million a year in treatment bills in England alone, though care must be taken to avoid any unintended health consequences. Furthermore, according to last year’s ground-breaking trial of the ‘Boilers on Prescription’ initiative, GP and outpatient visits were reduced by a third after homes were made more efficient. In turn, many decarbonisation strategies become “no regret” choices that can reduce stress on national health care budgets. Savings could extend to the health care systems themselves and improve the resiliency of these systems through reduced operating costs. The UK’s NHS has a carbon footprint of more than 18 million tons of CO2 per year, which is 25% of total UK public sector emissions. The NHS could save an estimated £150 million per year by increasing its own energy efficiency. The Lancet Commission’s latest report finds climate change could be the greatest global health opportunity of the 21st century. Furthermore, the benefits of decarbonisation could be felt immediately, while also protecting us from the worst health impacts of global climate change. These short-term benefits to health make many mitigation and adaptation responses “no regret” options, with tangible benefits to the current population as well as generations to come. To read more about the co-benefits of decarbonisation, please see the Lancet Commission’s report “Health and Climate Change: policy responses to protect public health” (released 23 June 2015). Melissa C. Lott is a PhD Researcher in UCL’s Institute for Sustainable Resources, where her research focuses on quantifying the public health impacts of energy systems.